Newly-elected MLA of Ranikor constituency, Pius Marweiñ, will take oath as a member of the tenth Meghalaya Assembly on Thursday. In the just-concluded by-elections held on August 23, Pius defeated former Assembly Speaker and National People’s Party (NPP) candidate, Martin M Danggo in Ranikor constituency while Meghalaya Chief Minister Conrad K Sangma, who is also the national president of NPP was elected from the South Tura constituency. Assembly Commissioner and Secretary Andrew Simons said that Pius will take oath in the office chamber of the Speaker at Khyndai Lad at 2 pm. 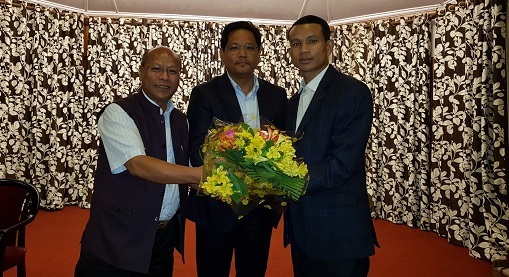 Chief Minister Conrad K Sangma and Pius Marweiñ were felicitated at the meeting of the Meghalaya Democratic Alliance (MDA) in Shillong on Wednesday evening. In Ranikor, Marweiñ defeated five-time MLA, Martin M. Danggo of the NPP by 2,896 votes. Marweiñ got 13,183 votes, Dango got 10,287 votes, PN Syiem of the People’s Democratic Front got 1978 votes and Congress candidate, Jackuis Sangma got 938 votes and NOTA polled 184 votes. With this win, the NPP’s tally has increased to 20, while the UDP has seven MLAs now in the 60-member Assembly. Both the NPP and UDP are partners in the MDA government. The MDA government is being led by the NPP under the leadership of Conrad as Chief Minister.